I’ve been wanting to do something like this since I saw it in a store in Iowa. Last week, we walked to the park and found a giant obliging brush pile with lots of potential home decor candidates. With tons of optimism, I returned with clippers and cut a few branches to compare. I ended up selecting this one because it had a great side branch, and some beautiful moss. When I brought the branch inside, it left a layer of dirt underneath it, so I promptly took it back outside for a good whacking to loosen any other debris. I didn’t want to change the natural beauty of the bark and moss, so I chose to sacrifice longevity by not adding a preservative. I think another option would be to remove the bark, maybe sand down the underlying wood, then treat it with a clear coat of polyurethane to seal it up. But that’s another project. For anchors on the top of each limb of the the branch, I used eye hooks from a picture hanging kit. I eyeballed the ceiling and hung a somewhat corresponding plant hanger and two additional white hooks where I wanted the branch to hang. 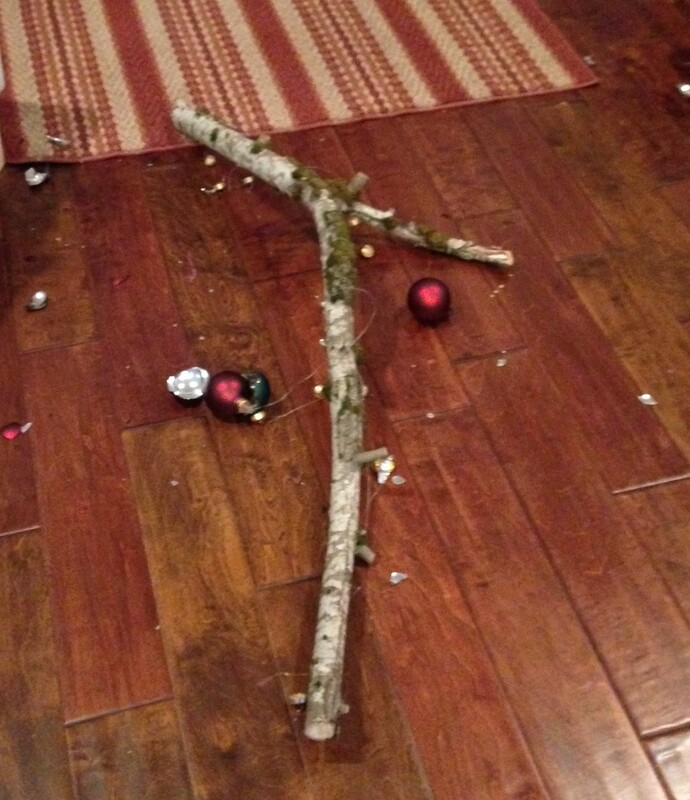 Note: When I hung the branch from the ceiling, the lines did not hang vertically, and I was a little disappointed. If I had it to do over again, I would see if I could dab some paint on the branch hooks and press it against the ceiling to mark where the ceiling hooks should go, this would give a more vertical hang. 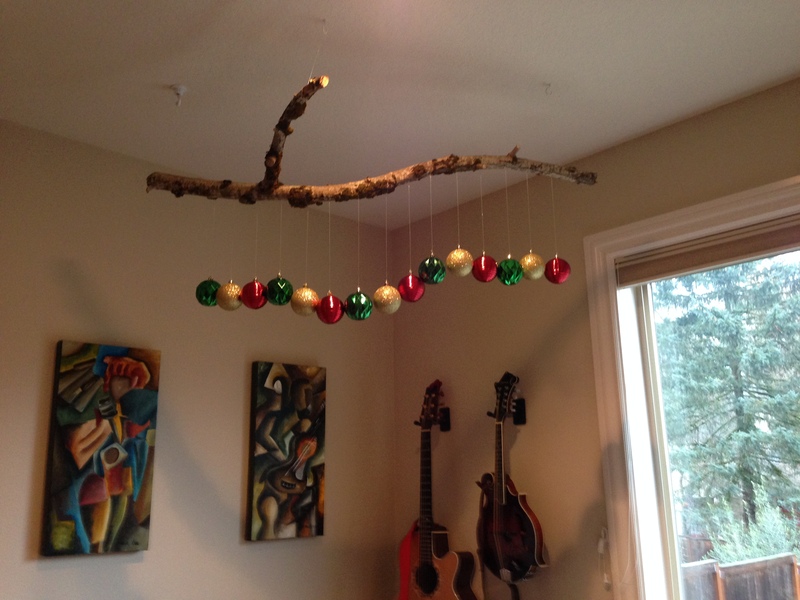 I did my first iteration of the project by hanging five red glass ornaments from the branch. But after I hung it up, the thought ‘I need more cow bell’ crossed my mind. The second iteration took longer to implement because I wanted the ornaments to hang from the same length of fishing line, something I was willing to fudge in the first iteration because it just didn’t cross my mind. With more ornaments, though, I wanted them to hang a bit more evenly and follow the curve of the branch. I rehung the original five and added ten more ornaments, and I used a thicker fishing line to hang it from the ceiling. This was the undoing of iteration two. As soon as I’d hung the branch from the first two hooks, I let go to reposition my step ladder, and the knot holding one of those two hooks came undone. The branch swung and must have lifted itself off of it’s hook, and the whole thing came crashing to the ground. In this picture, you only see a few ornaments, and a bunch of the ornament tops. The weight of these glass bulbs and the force of the swing pulled them from their housings! I was able to recover 10 or 11 whole ornaments of the 15 I’d used, but decided anything hanging so precariously from my ceiling should be shatter resistant. Thankfully, Zoe was upstairs attempting to take a nap and I was able to clean up without any toddler wrangling. I was pretty demoralized at this point, and wished I’d tested the new knots I’d tied, but in the end, I’ve decided I’m glad it happened so that I could move onto iteration three! My stick, adorned with fifteen strands of fishing line, each holding a pretty gold ornament top sat in the garage for a few days while I regrouped. But a few days later, I picked up some shatter proof ornaments and decided to make the third time the charm. Did I mention I was an optimist? 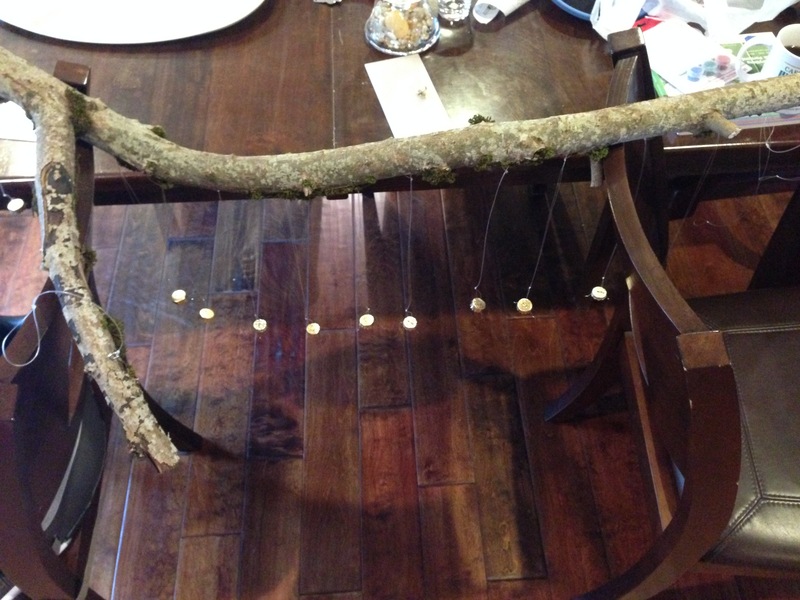 I balanced the branch between two chairs in our kitchen, and straightened out the existing lines. Then I removed each of the existing ornament changes, and looped the remaining loop through the new ornaments, readjusting the spacing of each line as needed. And if you note the state of the house in this pic – yes, I’m embarrassed to admit this is what it looks like when I’m in the middle of a project. Chad is happy this project is done, we’ve gone back to a more livable space. I retied new lines to my eye hooks on the top of the branch (and then I tightened and tugged on them to test them). And then I hung in our front room. Success!! I like the look of this branch, and we’ll see how it survives the season. 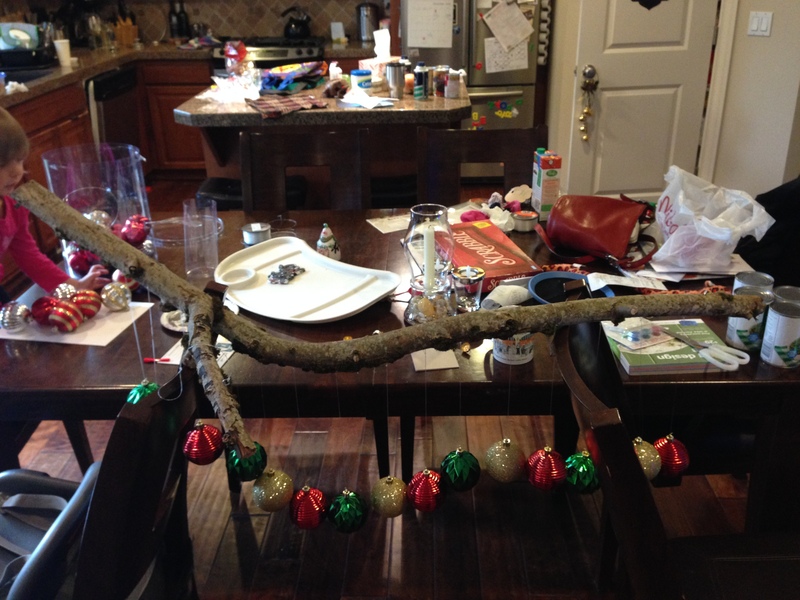 Perhaps I can repurpose the branch for the next holiday. Now if only I had a spotlight to show them off! Christmas Gift Spoiler Alert (for my family): I’ve been making these sweet bird feeders for Christmas and I got SO into it, I’ve inadvertently created my own cottage industry… all over the kitchen table… my desk… our console table… the garage… I’ve posted a few in my *NEW* ETSY store (my store name is – you guessed it: Mishinctrl). And I thought a good ol’ blog post would help to advertise. Do you have a bird enthusiast or gardener in your life that would appreciate a beautiful and quirky addition to their yard?